My mom prepares aval upma very often as a snack food for us during our childhood days. But I tasted the slightly sweeter version of it, only when I joined my first job in Pune. It was served with sev and lemon wedges there. 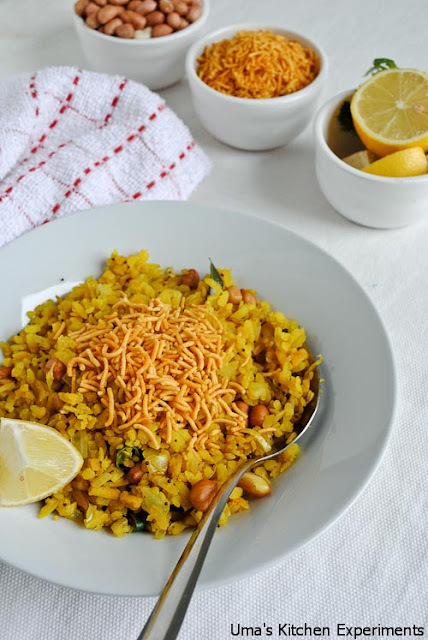 I loved the combination of crunchy sev and soft poha. From then, I started to eat Aval upma with sev. It is also sometimes served with potato. Till now, never tasted poha with potato but I have heard the combo works out well. 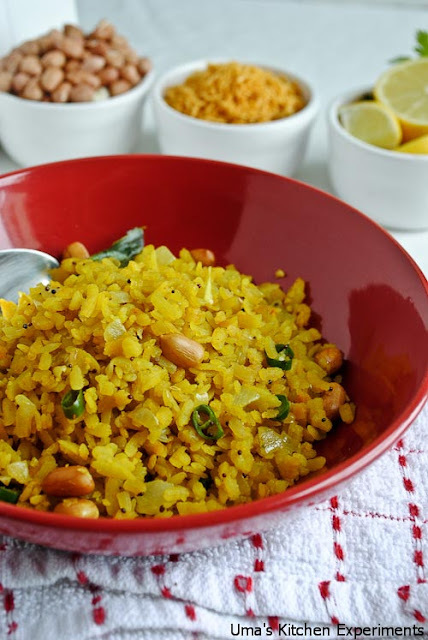 Here I am posting my Mom's way of preparing aval upma with my favourite sev and lemon wedges. 1) Wash poha in a running water quickly. Use colander to make this job easier. 2) Completely drain the water and transfer the poha to a bowl. 3) Add turmeric powder and toss well to mix it evenly. Cover and keep it aside for 10 minutes. 4) Meanwhile, Heat oil in a frying pan. 5) Add mustard seeds when it is hot. 6) Add greenchilli, curry leaves and peanuts after all the mustard seeds splutter. 7) Fry for 3-4 minutes without burning. 8) Add onion and saute until it becomes soft and translucent. Add salt and turmeric powder. Stir well to spread the salt evenly. Add sugar if using. 9) Add poha and reduce the flame. Stir gently without breaking poha. 10) After 4 minutes turn off the stove. Squeeze out lemon juice if using. 11) Serve with fine sev. Looks colorful. I would have liked the crunch from the set. 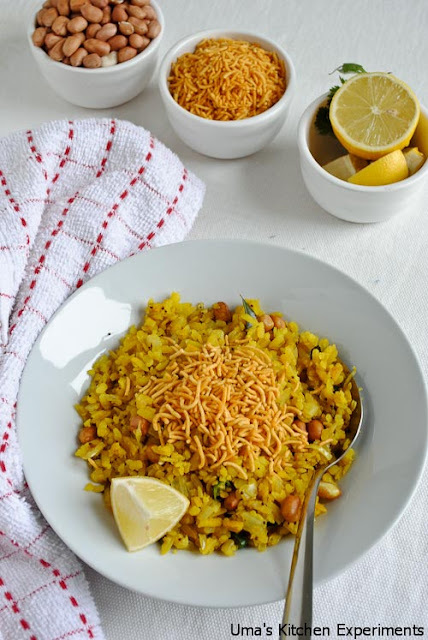 my fav one uma.. i too tasted this version when we lived in pune.. peanuts and sev makes every bite of poha crunchy and yumm..
one of my fav BF,looks very tempting!! Delicious, love the way you made it. Not sticky. love this poha upma,yummy yum delicious..perfect breakfast idea!! very delicious poha..yummy,even I top poha wid sev n finely chopped fresh onions..
Looks so good, crunchy and yummy. such easy n tasty upma..last clik is just awesome..lv try this.